Jack announces on CBS’ Sunday telecast of the Memorial Tournament presented by Nationwide Insurance that six-time major champion and CBS golf analyst Nick Faldo (left) has been named the 2015 Memorial Honoree. It will be the 40th playing of the tournament Jack Nicklaus founded and hosts at Muirfield Village Golf Club. 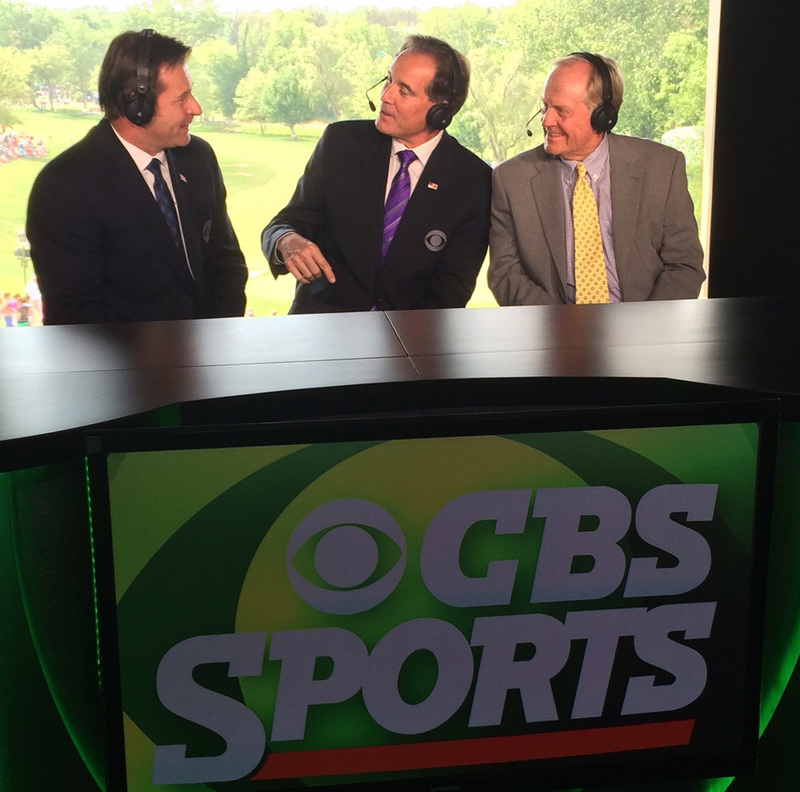 Veteran CBS Sports announcer Jim Nantz, center, joined the Memorial Tournament broadcast. The Captains Club today announced that six-time major championship winner Sir Nick Faldo has been selected as the Honoree for the 2014 Memorial Tournament presented by Nationwide Insurance, the 40th playing of the Tournament founded by Jack Nicklaus in 1976. In addition, golfing greats Dorothy Campbell, Jerome Dustan Travers and Walter Travis will be honored posthumously. Between 1987 and 1995 Faldo won three British Opens and three Masters Tournaments.While winning 39 tournaments around the world, including six events on the PGA TOUR, Faldo’s focus was on the major championships. In one stretch between 1988 and 1993, Faldo was never out of the top 20 in a Grand Slam event. Faldo relied on dedication, consistency, tempo and one of the strongest competitive minds in the game. Consistency, distance control and course management were his strengths. Faldo rallied in the final round with late birdies to win his third British Open by a stroke. At the 1996 Masters, the Englishman started the final day six strokes behind Greg Norman, but put together a flawless 67 to capture his third green jacket. Faldo’s most impressive major victory was the 1990 British Open at the Old Course at St. Andrews. Mastering the Old Course with dazzling iron play, Faldo stood astride the field, shooting 18-under-par 270 to win by five. Faldo participated in 11 consecutive Ryder Cups. He has also earned the most points by an individual in Ryder Cup history. Born July 18, 1957, in Welwyn Garden City, England, Faldo was a gifted all-around athlete. At 14, Faldo took up golf after watching the 1971 Masters on television and being inspired by the image and performance of Jack Nicklaus. An early teacher, Ian Connelly, told him, “The easier you swing, the better you’ll hit it,” advice which helped shape Faldo’s smooth tempo. Faldo won 10 titles in 1975 as an amateur and joined the European Tour the following season. Over the next eight years, he displayed a superb short game and putting stroke in winning several tournaments and establishing his career-long brilliance in the Ryder Cup. In 1998, after six major championship, 39 tournament victories around the world and 11 consecutive Ryder Cups, Faldo was elected into the World Golf Hall of Fame and then in 2009 was knighted by Queen Elizabeth. Today, Sir Nick is lead analyst for CBS Sports and the Golf Channel and maintains a thriving business, including golf course design, wine, apparel and the Faldo Golf Centers. He is also the founder of the globally honored Faldo Series, which creates opportunity through golf and develops tomorrow’s Champions around the world. An international initiative to grow the game, the Faldo Series was founded by the major champion 18 years ago. Today the Series reaches over 7,000 players each year through over 40 events in 32 countries. Faldo has four children: Natalie, Matthew, Georgia and Emma. Between 1905 and 1912, Dorothy won 10 national amateur championships in America, England, Scotland and Canada. Then, 12 years later, she won the American title once more. As Dorothy Campbell, and later as Mrs. J.V. Hurd, her count of national amateurs was three U.S., two British, three Scottish and three Canadian. In 1909, she became the first woman to win the U.S. and British Amateurs in the same year. In 1910, Campbell moved to Canada and won the country’s championship three consecutive years before moving to the United States permanently in 1913. When she won the American title again in 1924, she was 41 years old. She remains the championship’s oldest winner, and her 15-year span between victories is also the longest in the event’s history. When she lost the final of the 1920 U.S. Amateur to Alexa Stirling, it appeared to be her last hurrah. In 1923, she concluded that her game needed updating and changed her swing. Working with George Sayers, she forced herself to switch from the baseball to the Vardon grip. At the 1924 U.S. Amateur at Rhode Island Country Club, she defeated Mary K. Browne, the national lawn tennis champion of 1912 and 1913, 7 and 6, in the final. Although it was Hurd’s last championship, she was far from finished as a golfer. In 1926, she set out to surpass the record for fewest putts in 18 holes, 21, which had been set by Walter J. Travis. At the Augusta Country Club, Hurd came to the 18th hole with 19 putts when she holed out from off the green using “Thomas,” her famous mashie. Jerry Travers started golf at a very early age and became one of the most brilliant amateurs of his era. He won his first U.S. Amateur in 1907 at age 20 and successfully defended his title in 1908. During these years, he and Walter Travis fought a series of golfing duals and developed a serious but friendly rivalry. In 1915, Travers became the second amateur to win the U.S. Open. It was his only top-10 finishes in four appearances at the U.S. Open; he never entered the championship again once he had won it. Although a proven match-player, his victory in the U.S. Open was unexpected. A man with imperturbable golfing temperament, his putting was the strongest part of his game. Although all of Travers’ notable victories came as an amateur, he later became a teaching professional and gave exhibitions. Within four years of picking up a club for the first time, Travis won the first of three National Amateurs in 1900. He also was the first American citizen to win the British Amateur and ended his career, at age 53, by winning the prestigious Metropolitan Amateur in New York. Born in Australia, Travis came to the United States and made a substantial income in the hardware business. He played cricket and lawn tennis as a young man, without much success, and became hooked on golf after a visit to England in 1896. His most cherished trophy was the pewter tankard won in the first handicap competition at the Oakland Golf Club of Bayside, Long Island. He claimed his first U.S. Amateur title in 1900 at Garden City Golf Club on Long Island, and his name was engraved on the Havemeyer Trophy again in 1901 and 1903. In 1902, he set a U.S. Open record by shooting 75-74—149 for the final two rounds. The second-place finish to Laurie Auchterlonie was the highest by an amateur in the Open, and rather than collect the $100 prize, Travis asked the USGA to reserve $75 for a trophy. The remaining $25 was given to his playing companion, Alex Smith, whom Travis thought displayed “thoroughly sportsmanlike spirit throughout.” Two years later, Travis traveled to Royal St. George’s at Sandwich, England, for the British Amateur. On his way to the final, he defeated two of Britain’s best golfers, in Harold Hilton and Horace Hutchinson. The final was a relative breeze, as he defeated Ted Blackwell to win the famous cup. Because of his late start in the game, Travis was respectfully referred to as “The Old Man,” and in addition to becoming a fine player, Travis made a name for himself as a golf journalist, instructor and course architect. About Nationwide Nationwide Mutual Insurance Company, a Fortune 100 company based in Columbus, Ohio, is one of the largest and strongest diversified insurance and financial services organizations in the U.S. and is rated A+ by both A.M. Best and Standard & Poor’s. The company provides a full range of insurance and financial services, including auto insurance, homeowners, pet, motorcycle, boat, farm, commercial insurance, life insurance, annuities, mutual funds, public and private sector retirement plans, banking, mortgages, and specialty health services. For more information, visit www.nationwide.com.